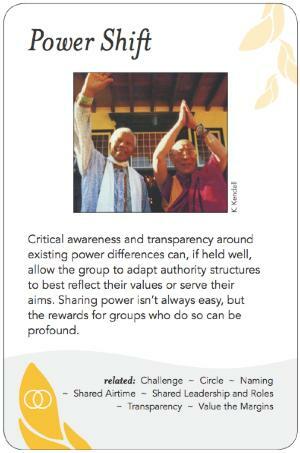 Critical awareness and transparency around existing power differences can, if held well, allow the group to adapt authority structures to best reflect their values or serve their aims. Sharing power isn't always easy, but the rewards for groups who do so can be profound. Facilitator has a tremendous role modeling job around power. Be aware of your own power issues. The persuasive power of those who are empassioned. Look for style differences that bring up power: extravert / introvert, group with shared values, etc. Observe: where do folks look to during the meeting? Technique: have those with more power speak later. If participants choose not to collude, they may not be able to participate - they may have to say no to some of the work. As a facilitator hired often by power broker, it's possible to be lulled into assumptions around level of openness, equality etc. Question: how many levels of hierarchy (and what strength of difference) can function healthily together in terms of power dynamics? - Make sure you do enough due diligence to understand the differences between the stated culture & the real culture. Particularly be aware of any ways in which the culture may be toxic. - Note that folks can get triggered around power issues, amplifying or creating the dynamic. - Power abuse & dysfunction is a common trigger. - Try to be aware or sensitive to the context of the group... e.g.. Sue's example of talking about how we "imprison" ourselves triggering someone who was imprisoned. Open Space - group contributes the topics, identify roles, etc. Starhawk's "Power Over / Power With / Power From Within"
Fantastic description from Chris Corrigan of his experience co-leading a workshop in New York City at the same time Occupy Wall Street was happening: http://chriscorrigan.com/parkinglot/?p=3390.